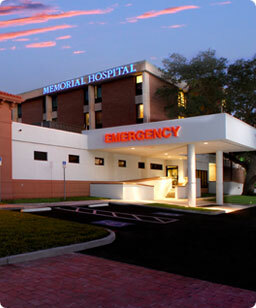 Memorial Hospital of Tampa has been providing comprehensive healthcare services for residents of south Tampa and the surrounding community for over 30 years. Recent renovations and the addition of state-of-the-art technology has kept the hospital modernized to provide high-quality medical care, including emergency medicine, diagnostic procedures, surgery, outpatient therapies and acute care for hospitalized patients. With a high caliber medical staff and a team of caring, skilled employees, it’s no wonder Memorial Hospital has a long-standing reputation for excellence. Advanced diagnostic technology, including a 64-slice CT Scanner, PET/CT Combo, MRI/MRA, Nuclear Medicine, CT Angiography, Cardiac Scoring, Digital Mammography, Breast MRI and Stereotactic Biopsies, Ultrasound and Bone Densitometry with Low Dose 64 slice CT Scanner.